Although even rarer than aplastic anemia, paroxysmal nocturnal hemoglobinuria (PNH) can occur in aplastic anemia patents. In this interview, Dr. David Araten of New York University discusses the rare, and often complex scenario of a dual diagnosis. Here’s what patients and their doctors need to know. How common is PNH appearing in patients with aplastic anemia? The dual diagnosis of PNH and aplastic anemia is quite common. Perhaps half patients with PNH will have some sign of aplastic anemia, and a little less than half of aplastic anemia patients will develop the PNH clone. There are patients who fall more on one side of the spectrum or the other. Some will require treatment for PNH, some for aplastic anemia, some for both, and some for neither. With aplastic anemia-PNH, the PNH can occur before, at the same time, or after the aplastic anemia is detected. All aplastic anemia patients should be tested for PNH at diagnosis and then maybe every year. Their LDH level should be periodically checked, as that can be an early sign that PNH is emerging. Are there any areas where the boundaries or definition of one disease appears to overlap with another? With aplastic anemia/PNH, both of those can be associated with anemia, although this happens for different reasons. In classic PNH, there is breakdown of red cells and the reticulocyte count is high, but with aplastic anemia, there is low production of red cells and the reticulocyte count is low. Sometimes what happens in aplastic anemia/PNH is the reticulocyte count will be elevated, but not to the level it should be. Is PNH treated any differently when it appears in a dual diagnosis with aplastic anemia? Patients with the overlap syndrome would be treated differently from a patient with only PNH. Patients having classic PNH may need eculizumab (Soliris®) or anticoagulants to prevent blood clots. Aplastic anemia patients need immunosuppression, generally being horse ATG followed by cyclosporine. But patients with PNH-aplastic anemia overlap maybe not respond as well to eculizumab if they have a low reticulocyte count. They may need immunosuppression first, and may not be not be able to receive anticoagulants if their platelet count is low. Conversely, for a PNH-aplastic anemia patient, there can be problems with ATG treatment. The reaction patients get with ATG can trigger hemolysis. In patients a with large PNH red cell population who need aplastic anemia treatment, one thing to do is give them enough red cell transfusions, in order to dilute their PNH red cells so there are very few of them still there that can hemolyze when they receive ATG. This might be two units of red cells a week every week for three weeks, for example. This could be enough to prepare someone with many PNH red cells to get ATG. Are there possible complications from these treatments? One thing to keep in mind is that patients with aplastic anemia typically get iron overload, sometimes requiring treatment for this, but patients with PNH often become iron deficient, and patients with AA/PNH can have either situation, depending upon where they are on the spectrum. Another way that the overlap syndrome can be important has to do with kidney function. Patients with aplastic anemia who require cyclosporine can experience an effect of the drug on their kidneys, and rare patients with PNH will develop a serious loss of kidney function as well. I suspect that the use of cyclosporine in a patient with a large PNH clone will be more likely to have an effect on the kidney function-- unless they are also on eculizumab. Another consequence of the overlap syndrome is the effect of the combination of eculizumab and cyclosporine. In practical terms, if a patient is on either drug, they must go immediately to the hospital if they develop a fever. For cyclosporine, this is to make sure that they do not have one of many possible infections. For patients on eculizumab, in general this would be to make sure that they do not have meningococcal infections. For patients on eculizumab who are also on cyclosporine, there is always a theoretical concern that they might not be able to make antibodies in response to a vaccination because of the effects of the cyclosporine, and that they would be doubly immunosuppressed. However, if one uses this type of caution, patients who need both can be on both. There are rare cases where patients have a triple diagnosis – PNH, aplastic anemia, MDS. Is there anything different about these? These are exceedingly rare, at least when the narrower definitions and criteria for overlap syndromes are applied. In the case of PNH/aplastic anemia/MDS overlap syndrome, when the criteria for MDS is excess blasts, complex cytogenetic abnormalities, or monosomy7 with lack of response to immunotherapy, these cases should be considered for a stem cell transplant. But this only applies if this criteria is used. If you have a patient with PNH-aplastic anemia, and trisomy 8, this does not give a triple diagnosis according to the strict criteria that I would use. Trisomy-8 can be seen in PNH or aplastic anemia, but it doesn’t secure a diagnosis of MDS. 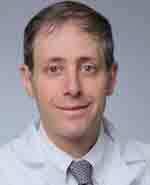 Dr. David Araten is an assistant professor in the Division of Hematology at the NYU School of Medicine in New York City. Prior to holding this position, he worked as an assistant professor and instructor in hematology at Memorial Sloan-Kettering Cancer Center, also in New York City. His residency was in internal medicine at Columbia-Presbyterian Medical Center and received his medical degree from Harvard Medical School in Boston. Dr. Araten’s research has focused largely on PNH and he has published in a wide variety of peer reviewed journals on this topic. He is also a recipient of the 1997 New Researcher Award & Vernille Family Fund Research Grant awarded by the Aplastic Anemia and MDS International Foundation. Originally published on Tue, 01/01/2013 - 10:04pm. Last updated on Fri, 03/11/2016 - 1:41pm. Published on Wed, 04/15/2015 - 9:38am.